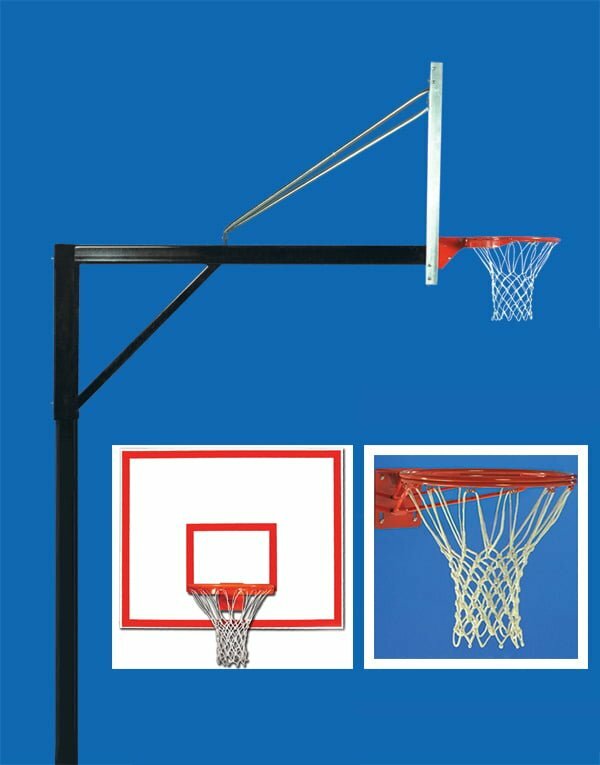 42” x 60” durable Rectangular steel backboard has a 12 gauge steel shell with white powder-coat finish and printed target and border. Has integral reinforcing steel channel on reverse side for mounting and increased board support. Has 20” x 35” mounting centers for attaching board to structure. Capable for direct mounting with integral keyhole slots to permanently attach board to post and allow for goal replacement without removing board. 5 x 5 hole spacing. 10 Year Limited Warranty. 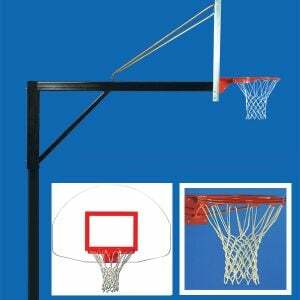 Front mount Dura Goal I offers affordable and yet superior playground performance. 18” Double steel ring has a 5/8” top ring and 1/2” bottom ring. Rim has dual 5/8” x 15” bracing and a universal backplate. Fixed rims are not recommended on glass backboards. Includes nylon net.